Refugee camps are “microcosms of the Middle East, with all the same ethnic and religious tensions”, which become further intensified, causing violence, according to British aid worker Yochana Darling. Five Christian converts and two children from Iran were attacked last month in a refugee camp in Greece and told to leave as “this is a Muslim camp”. Following the incident, which took place on Sunday 24 June in a camp near the city of Larissa, about 360km northwest of the capital Athens, an aid worker says there should be more protection for religious minorities among refugees as they are “extremely vulnerable”. Religious minorities currently comprise approximately 2-4% of the total refugee population arriving on Europe’s shores, according to Yochana Darling, British founder of the International Christian Consulate (ICC), which supports Christian refugees in the camps in Greece. Often they have fled violence and persecution in their home countries, only to discover that once in the camps, or other refugee accommodation, they are still being targeted because of their faith, Darling explained in an interview with World Watch Monitor. “All the other minority groups are considered to be in need of protection, but religious minorities are by and large off peoples’ radars … There is a need for more awareness … and there should be recognition of problems that [they] face in the camps, especially converts,” she said. Darling has been working with Christian refugees in Greece for the last two years and says the camps are “microcosms of the Middle East, so all the same ethnic and religious tensions exist and, in many ways, are intensified in the camps. Violence is a regular occurrence”. Research conducted by the ICC shows that “88% of all Christian refugees have experienced or witnessed faith-based persecution and discrimination at the hands of extremist Islamists in their home countries, en-route to Europe, and, significantly, continue to do so in Europe’s refugee accommodation”. Among them are Hamid and Fatimah*, and their three-year-old daughter. Two years ago they travelled from Iran to Turkey, where they became Christians at a church in Istanbul. “While in Iran they had been given a Bible secretly and were keen to convert but too scared to do it in their home country, where apostates can be executed. They stayed in Turkey for four months before continuing their journey to Serbia, where they were for ten months,” Darling explained. “Things were really bad there,” she said, “including threats because of their conversion.” But here they met another couple, also travelling with a young child, who had fled Iran because of threats from their family due to their conversion to Christianity. “Amir and Mahsan had been secretly studying the Bible together in Iran, when they were discovered by some family members who were strong Muslims and part of the Revolutionary Guard. They fled as the family were threatening to kill them,” Darling said. After they met in Serbia, the two families left for Greece together and were picked up by Greek police and put in a camp in Thessaloniki. There they met Mustafa, another convert, though a much more recent one, according to Darling. 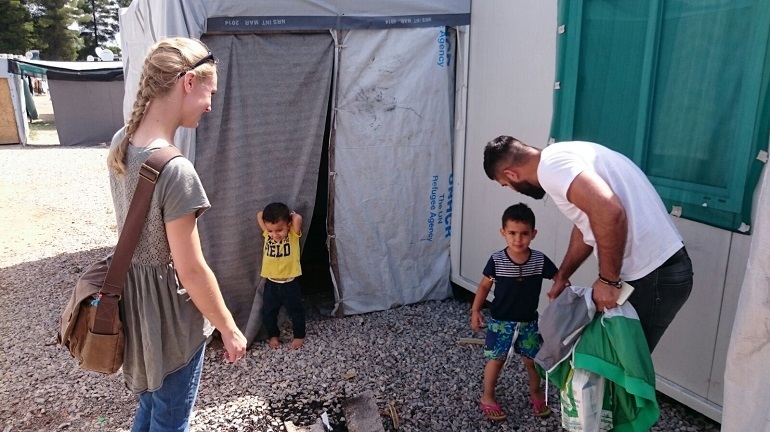 After a brief stay in the camp in Thessaloniki, two months ago they were moved to Larissa camp, one of the hottest and driest places in Greece. There the two families shared a small container-cabin (called a ‘Connex’), where Mustafa would visit them to read the Bible together. “However, others in the camp found out that there were converts among them and on 24 June, in the middle of the night, a group of about 30-40 refugees attacked the two families while Mustafa was with them. They had just returned to the camp after attending church for some more Bible-reading together. “The attackers poured petrol over the cabin where they were meeting, and threatened to set it alight. They beat up the men and held knives to the throats of the two women and children, while telling them, ‘This is a Muslim camp. You have to leave’. A child plays in front of a mosque in Ritsona refugee camp just outside Greece’s capital Athens, as refugees pray during the holy Islamic month of Ramadan on 14 June 2018. “When the refugees called in the police to come and help, they were told that they would not come as they were afraid. They were only a small number compared with the hundreds of people in the camp,” Darling said, adding that she has heard similar stories from many other refugees who have been in similar situations. One of the men who was attacked suffers from a heart condition, but the ambulance that was called in to help him initially was not allowed in, having to wait for over an hour, according to Darling. The following morning, at 5am, the others fled the camp with the help of a group of Afghans. They went straight to their church in Larissa and asked for the pastor’s help. He contacted ICC and assisted the families with train tickets to Athens, where they were taken to ICC’s safe house. Since it was established in 2016, the organisation has helped 65 families. This includes registering them with the UN High Commission for Refugees (UNHCR) so they can start receiving aid packages. This process takes time, Darling explained, because most of the refugees entered Greece overland and crossed the border without registering themselves. Darling says the incident has been reported to both the UNHCR and the police. She says the UNHCR in Athens is gradually paying more attention to the vulnerability of religious minorities but that they “have little influence on how camps are run in Greece, so the problem still very much exists. * All names changed for security reasons.